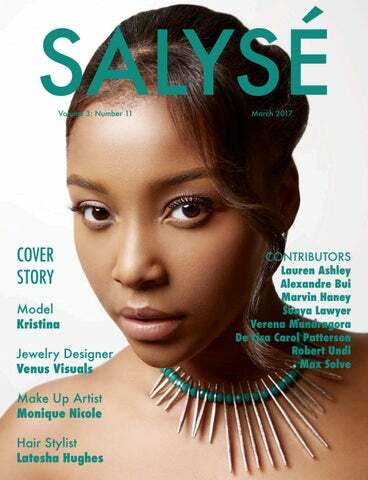 SALYSÉ Magazine is a photography magazine, featuring beauty, fashion, and conceptual art editorials. We do not seek to define beauty with one narrow idea, but with myriad viewpoints Vintage is right next to emerging designers, who are right next to established designers. We are looking for creatives who push the envelope, take chances, and disregard the status quo. SALYSÉ Magazine is about sophistication, authenticity, with a touch of eccentricity. 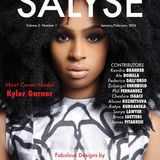 ---------FOLLOW https://instagram.com/salysemagazine/ LIKE https://www.facebook.com/salysemagazine SUBSCRIBE http://issuu.com/salysemagazine PURCHASE http://www.magcloud.com ---------Not just a magazine— a movement! www.salyse.com © SALYSE, LLC All rights reserved. Letter from the Editor Dear Salysians, HAPPY SPRING!!! It has been awhile since I was in the studio. It felt soooo wonderful to be behind the camera again. I just want to thank an awesome team that allowed my return to go smoothly. The models: Delaina, Kristina, and Jessica. The makeup artists: Monique Nicole and Yanick-Nikita Lunford. The hair artists: Latesha Hughes and Kanika Styles. Thank you ladies for your artistry! #teamworkmakesthedreamwork This issue was so much fun to put together! I love the fact that a variety of beauty “standards” are depicted. I hope you enjoy reading this issue as much as I enjoyed curating it and putting it together. 17 Black tank top: Pull & Bear; Silver jacket: Vintage, no label. Gold jacket: Vintage, no label. 21 Shirt: Pull & Bear; Bomber jacket: Vintage, no label; Jeans: Zara; Shoes: Dr. Martins. Cap: Vintage, no label; Top: Amateur fashion; Silver jacket: Vintage, no label; Jeans: Levis; Socks: Burlington; Shoes: Converse. Backless top: Amateur Fashion; Jeans: Levis; Shoes: Jeffrey Campbell. Jacket and Top: Vintage, no label. Necklace: Zara. 27 Cap: Vintage, no label; Shirt: Armanii; T-shirt: Zara. Gold jacket: Vintage, no label; Overall: Amateur Fashion; Scarf: Zara; Shoes: Dr. Martins. Shirt: Pull & Bear; Jacket: Vintage, no label; Jeans: Zara; Belt: Handmade. On him: Shirt: Pull & bear; Bomber jacket: Vintage, no label; Jeans: Zara. On her: Hair band: Vintage, no label; Top: Amateur Fashion; Leather jacket: Mango; Jeans: Levis. 49 Gold brocade blazer: Tallia. Favorite superhero? Why? Wonder Woman. She does it all and that’s me. What person, living or dead, do you admire the most? Why? J.K. Rowling. She was able to become the richest woman in the world after being homeless. She had faith. What is your favorite body part? My eyes. What do you do when you are not modeling? I’m a wife, and a bartender. Guilty Pleasure? Candy, lots of it. I don’t drink water, I drink Fanta lol Last show you binge-watched? Lemoney Snickets on Netflix Last book you read? Knowing God by His Names Anything else you want the readers to know about you? I’m a 22 year old Nigerian woman married to the love of her life trying to become a phenomenal woman my future children will be proud of. Meet Make Up Artist Yanick-Nikita Lunford How did you get started? Tell us a little about yourself. Hello! My name is Yanick-Nikita, also known as BeautiiQueenYaniiArtistry. I have always loved makeup since I was a little girl watching my mother do her makeup and wanting so bad to be able to do my own makeup. Once I got older and was able to purchase my own makeup, friends of mine started asking me to do their makeup and it was then that I knew that I wanted to be in the beauty industry, but I didn’t start taking it seriously until 2012. I started off doing beauty parties, and makeup for friends and family, until I developed a steady client base and started doing weddings, photo shoots, fashion shows and more. Speak it into existence, where do you see yourself in 5 years? I see myself continuously growing in my artistry to be one of the best! I see myself being a respected and recognized makeup artist in the industry working on different television, commercial and international projects. What zodiac sign do you get along with the most? Leo. Meet Model Kristina How did you get started modeling? Tell us about yourself. I started modeling around my second semester in college. People I knew and even strangers on the street would often tell me that I should model. One day I just decided to go for it. It was way out of my comfort zone. I submitted to an online casting call and an agent replied....told me to come meet in New York. I got signed to her agency and the rest was history. I was published in Jet Magazine, Hype Hair Magazine, Today’s Black Woman Magazine, and have been the face of a few national hair ad campaigns and more. Three adjectives to describe yourself. Creative, Loving, Blessed What do you enjoy the most about modeling? What I enjoy the most about modeling is that we get to change and take on new personas and moods when it comes to hair, makeup, clothes, art direction etc. It’s like we are going into character on set. It really excites me! What do you not enjoy about modeling? What I hate most about modeling is the industry “standards” that body shames, skin shames, and makes us sometimes feels as if we aren’t good enough. Favorite color? My FAVORITE color is PINK Favorite food? My favorite food is Buffalo wings and they have to be spicy! What designer would you love to model/walk for? Why? I would love to work with Jeffrey Campbell, I love his unique shoe designs! I have owned a few pairs. What photographer would you love to shoot with? Why? I would love to shoot with Steven Meisel because of course he is iconic in the fashion industry! He was one of the first people my agent told me to get familiar with his work. Speak it into existence, where do you see yourself in 5 years? In 5 years I plan on not having to work for anyone at a traditional job and starting my own business! Dream vacation you would like to take (or have taken)? My dream vacation is to go to a resorts village in the Maldives...it’s beautiful! Your zodiac sign? Gemini (We Rock, but can get a lil crazy) lol Favorite superhero? Why? My favorite super hero would have to be the Flash, only because I’m really into the show. What person, living or dead, do you admire the most? Why? The older women in my life (my mom and two older sisters) are who I admire the most. I admire them for their strength, determination, and ability to get things done even in tough situations. What’s your favorite quote? “I can do All things through Christ who strengthens me.” What is your favorite body part? My favorite body part are my beauty marks. What do you do when you are not modeling? When I’m not modeling I love creating! I love taking nothing and turning it in to something. So I do alot of DIYS and I love decorating for parties and events. Meet Hair Stylist Latesha Hughes How did you get started? Tell us a little about yourself When I was about 12 years old, I said I am either going to be a registered nurse, hair stylist, or nurse practitioner . I am 30 years old with a 12 year old son just trying to be the best mom and hairstylist I can be. Three adjectives to describe yourself. • very low key shy • humble • full of life Hair Artist or Hair Stylist? Why? I consider myself to be both. *Hair Artist comes out on set behind the scenes to create a vision with hair for the photographer. *Hair Stylist is on a daily basis when I work with my new and existing clients. What do you enjoy the most about being a Hair Artist/Stylist? I enjoy being able to be pushed to the max with my imagination and being able to meet new and exciting people on a daily basis and just [being] someone that people can really depend on. What do you not enjoy about being a Hair Artist/Stylist? Long hours of standing can be bad for your back and you might miss key points in your children’s life if you are a single parent. Other than yourself, favorite hair artist/stylist? Why? I have two favorite stylists; ones a man, Kalixto Balount; and ones a woman, Kearnna Stewart. These two gave me a story to always have in my mind for when I get weak. I watch these two struggle and strive for greatness. In the last year, I became a full time stylist. So, when I get weak I have two amazing success stories in my mind and behind my back pushing me. What hair trend do you love? I’m loving all the braids from all cultures. It makes the world look as if we are in peace. What hair trend do you wish would die a slow, painful death? I wish Mohawks would leave this earth. lol Favorite color? Lilac Favorite food/drink? Favorite food is tilapia Favorite drink is anything that resembles a wine glass filled with it. lol What person, living or dead, would you love to work with? I would love to work with my granny. She’s deceased. Her name was Erie Murray, and we have the same birthday. What would it be? A cooking show. Speak it into existence, where do you see yourself in 5 years? In five years, I see my name being a household name to hair whether I’m on stage talking to millions of people; behind the scenes 90 on set; or, at Cole Stevens Salon. #savyy_chic will be known world-wide and have Hair Gawddddd attached to it. I’m claiming this! I also see me and my son traveling the world all SALYSÉ because of mommie’s job duties. What is your idea of perfect happiness? Through it all just remain the same-- through the highs and the lows stay humble and respectful. It takes you a long way and is eternal bliss. Your zodiac sign? Aries What zodiac sign do you get along with the most? I have no picks. I love people. What’s your favorite quote? “A dozen roses has twelve in it. Do you think that each rose has the time to watch another bloom? Flowers don’t watch others bloom they just blossom.“ Dream vacation you would like to take (or have taken)? I would like for me and my son to take 14 days to travel around the world. I would like for him to have a chance to see all that life has to offer. What’s your theme song? Remy Ma - “All the Way Up nothing can stop me “ What’s the best/worst gift you’ve ever given/received? Best gift was a pair of shoes worth about $700. Worst gift was when I lost cash right before a baby shower and only had $25 to give. What a horrible embarrassing moment! What product is in your kit that you can not live without? Wella Thermal heat protector spray Favorite movie? Matilda Favorite actor/actress? Actress - Dakota Fanning. She’s a work in progress but a great one. Actor - Bruce Willis What’s the hardest thing you’ve ever done? Just keeping faith when things seem as though they aren’t happening. This is always going to be a forever battle. I’m human and it’s life. Last book you read? Td Jakes “ Just Let it Go” Guilty Pleasure? Choclate candy. Last show you binge-watched? Downton Abbey Anything else you want the readers to know about you. I just want to make it, not for fame, but for the story. I want to give millions of people the courage that they lack and to see and know all journeys start off slow but it’s how long and hard you hang in. That is when you get that satisfaction! Meet Make Up Artist Monique Nicole How did you get started? Tell us a little about yourself. I grew up modeling as a child. It was not until college that I really got into makeup. My mom gave me the idea to take makeup seriously and to pursue it after college. Three adjectives to describe yourself. Creative, hardworking, focused What do you enjoy the most about being a MUA? I really enjoy enhancing my clients’ natural beauty and providing an additional layer of self confidence. What do you not enjoy about being a MUA? I’ve only been doing makeup artistry for about 5 years, I have not yet gotten to the point where there is anything that I do not enjoy just yet. Give me a few more years. I may have a list by then. Other than yourself, favorite make up artist? Why? Some of my favorite artists are the legendary Sam Fine, Renny Vasquez, Carola Gonzalez, and Mary Phillips to name a few. I love Sam Fine and Renny Vazquez’s approach to African-American skin. I am absolutely obsessed with Mary Phillip’s work with Jennifer Lopez and Carola Gonzalez’s work with Kerry Washington. Favorite color? My favorite colors are purple, cerulean, and magenta. Favorite food/drink? I like food too much to be able to name just one thing. #Foodie Dream vacation you would like to take (or have taken)? I try to take an international trip once a year, my favorite trip thus far was Cape Town, South Africa. Dream vacation you would like to take (or have taken)? My dream vacation would be a series of trips throughout the islands from Dominican Republic to Bora Bora and Mexico staying in hotels over or near the clear ocean water while enjoying a swim with dolphins. Your zodiac sign? Gemini Favorite superhero? Why? Barry Allen aka The Flash I like how he is a man that helps all threats big and small. Not only is he a hero but he tries to live a normal life with a real career in forensics. Overall a great guy, a family guy who cares and a hero for all. What person, living or dead, do you admire the most? Why? Her name is Natasha and I admire her more than anything for who she is, what she has accomplished and what she does or has done for me and others. She is a mentor, a sister, and a friend who I look up to and trust. What designer would you love to model/walk for? Why? Donatella Versace, I love the designs and work, especially of some of the dresses. There is an edge to the her designs that is very appealing to me and I appreciate her success in creating a well-known brand. Speak it into existence, where do you see yourself in 5 years? As a mom, model and student there are so many roads that can be taken, but I would love to be in my last year of grad school, have my kids in modelling and myself modelling for some great designers or as a brand model for a big company such as Loreal. What do you do when you are not modeling? Go to school and take care of my beautiful twin boys. carefully handpicked by a fair paid ethnic group in the Peruvian Amazon. Huayruro (why-ee-ru-ro) seeds come to her customers in its natural state, no chemicals have been used to give them the red/black color, shape and shine they have. Each of her pieces is carefully handcrafted, inspired by Evelyn’s Peruvian heritage fused with the latest jewelry trends. entrepreneur through her popular blog www.twoworldsonechica. com, as well as being a motivational speaker at different conferences throughout the United States and worldwide. Her jewelry is presently exhibited at some of the most prestigious galleries of art, museums and boutiques in the United States. Among them: The Smithsonian American Indian Museum, The Natural History Museum of Harvard University, The Museum of Art & Design in New York and The Ritz Carlton in Saint Thomas. She is regularly invited to participate in various shows and exhibitions throughout the United States, such as the American Indian Museum New York Holiday Show and the International Monetary Fund Summit Meeting. Her goal is to be a role model, motivating many aspiring young entrepreneurs who are pursuing their dreams. Her favorite motivational quote is “With dedication and perseverance, ALL DREAMS ARE POSSIBLE!” This quote has helped Evelyn continue designing her eco-friendly jewelry line, even when faced with great obstacles. It has also helped her preserve her heritage and culture through her jewelry designs, hoping to bring the magic and mysticism of Peru to other countries and continents. Since 2008 Evelyn has been teaching different jewelry classes in Spanish and English at Montgomery College in Rockville, Maryland.